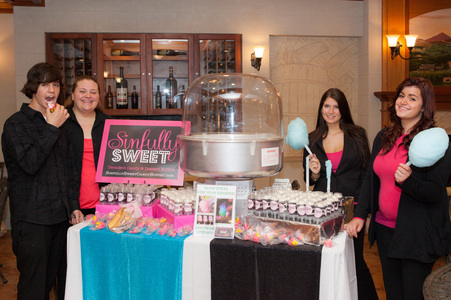 Sinfully Sweet is "Fully Insured"
Custom Candy Buffets For Any Occasion! At Sinfully Sweet, all of our creations are custom. all of your childhood favorites, elegant displays of layered candies color coordinated for your event, or era based candies, Sinfully Sweet will be sure to make your tummy smile! Our awesome team will make your event SUPER sweet! Karin Hlywiak, AKA "The Candy Boss" has been an event planner for over eighteen years. Her endless creativity and passion really shine through with each and every event she is a part of. Her talent has been duly noted as she has been featured in countless magazine articles, such as "Serendipity"and "Martha Stewart" just to name a few. Karin has also been awarded "Best of the Knot" 2013, 2014, 2015 and in 2016 was given the highest honor by being placed in the Knot Hall of Fame which places her companies in the top 1% in the country! Our candy boss has also been featured on TLC's hit show "Four Weddings," where her couple won first place! Her love for everything sassy, chic, and elegant has helped her become one of the best in the field through-out the tri-state area! Her bubbly and vivacious personality is infectious and she knows exactly what to do to bring out the inner child in you. Karin's experience with designing and implementing a client's vision really comes in handy when creating custom candy & dessert buffets. Our candy boss has a sweet spot for everything that sparkles, glitters, and shines. When you combine her originality, personalization and extreme attention to detail, Karin will not disappoint. When it comes to designing your event-from centerpieces to your very own candy bliss, you and all your guests will be in awe! Inquire about our cotton candy glow stations!